In business, change is constant. Causes of change in an organization are varied. They can be the result of products being removed from circulation, a modification in government and governmental policy, mergers and acquisitions and strategy and structural changes. Failing to take into account all areas of the organization affected by the change is a common reason why change initiatives fail. Identifying different drivers of change helps organizations consider their implications to the business. 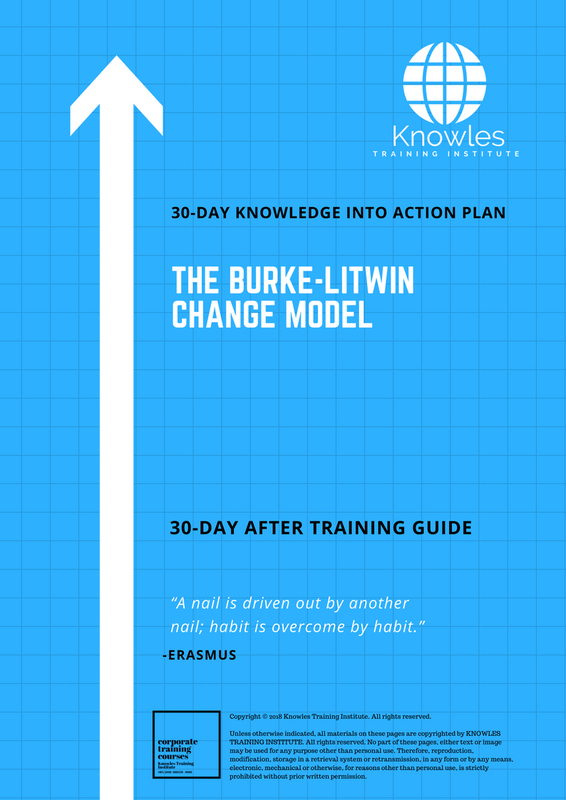 The Burke-Litwin Change Model is a tool that helps change managers do that. It was developed in 1992 by two organizational change consultants, W. Warner Burke, and George H. Litwin. 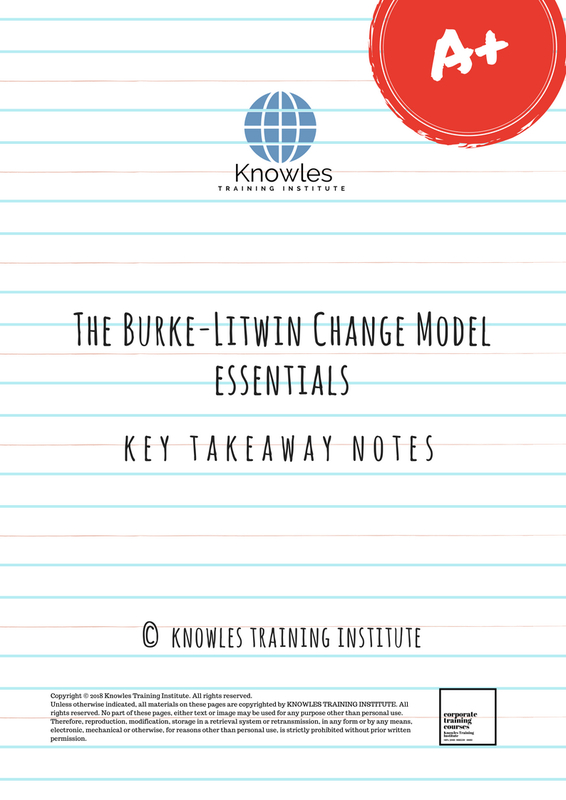 The two primary uses of The Burke-Litwin Change Model are to either diagnose a problem within the organization or create an action plan for a change initiative. Defining and establishing a cause-and-effect relationship between 12 organizational dimensions that are key to organizational change is the foundation The Burke-Litwin Change Model is built on. These dimensions are grouped into four elements within an organization; the external environment, transformational factors, transactional factors, and performance. The external environment refers to any forces or conditions outside of the organization that will affect its processes. Transformational factors include the organization’s leadership, mission, and culture. These are factors that will be most strongly affected by the external environment and will also have the most substantial influence on transactional elements. Transactional factors refer to day-to-day operations within the organization. Change in these factors is only likely to lead to lasting change if, in turn, the transformational elements are also affected. Among other factors, these include management practices, structure, systems, and motivation. 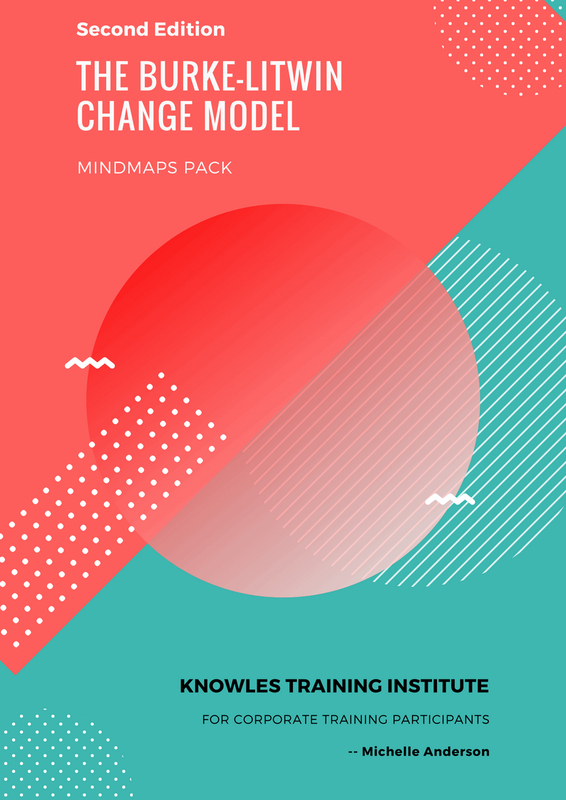 This course describes what the Burke-Litwin Change Model is and how to use it to identify and deal with drivers for change. Participants, at the end of this course, have the tools, skill, and knowledge to drive successful change in their organizations. This The Burke-Litwin Change Model workshop is ideal for anyone who would like to gain a strong grasp and improve their The Burke-Litwin Change Model. The duration of this The Burke-Litwin Change Model workshop is 1 full day. Knowles Training Institute will also be able to contextualised this workshop according to different durations; 2 full days, 1 day, half day, 90 minutes and 60 minutes. ● Explain what the Burke-Litwin Change Model is. 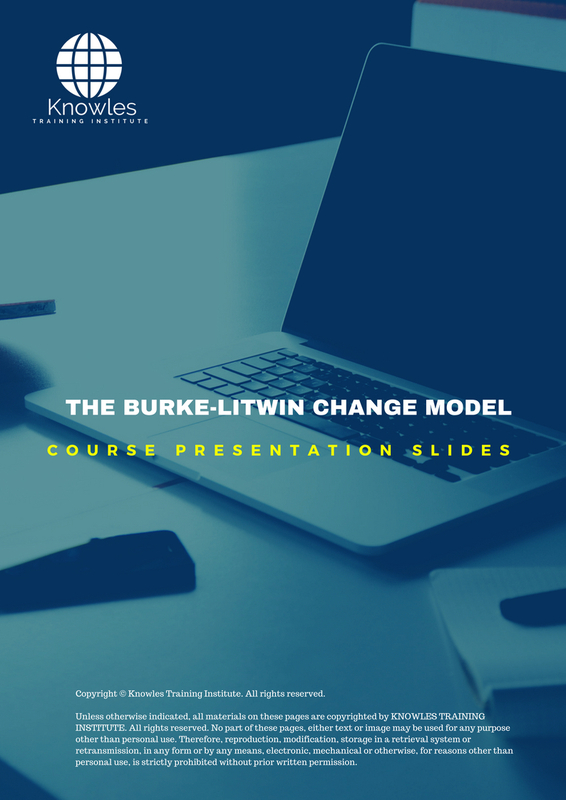 ● Understand how the Burke-Litwin Change Model is used. ● Know the 12 organizational dimensions of the Burke-Litwin Change Model. ● Continually scan the external environment for issues that will affect you and your team. ● Effectively communicate change initiative implications to staff. ● Ensure that your behavior fits with the expectations of new change initiatives. ● Assess the impact of structural changes and ensure your team understands why they are required. ● Manage changes to the immediate working environment with sensitivity to reduce resistance. ● Assess task requirements and individual skills/abilities concerning the required changes. ● Identify any risks in team dynamics and mitigate them as best you can. ● Know how to maintain motivation throughout a change project. ● Successfully implement a change initiative. ● What is the Burke-Litwin Change Model? ● 12 organizational dimensions of the Burke-Litwin Change Model. ● Dimension 1 – External environment. ● Dimension 2 – Mission and strategy. ● Dimension 3 – Leadership. ● Dimension 4 – Organizational culture. ● Dimension 5 – Structure. ● Dimension 6 – Management practices. ● Dimension 7 – Systems. ● Dimension 8 – Work unit climate. ● Dimension 9 – Task and individual skills. ● Dimension 10 – Individual needs and values. ● Dimension 11 – Motivation. ● Dimension 12 – Individual and organizational performance. 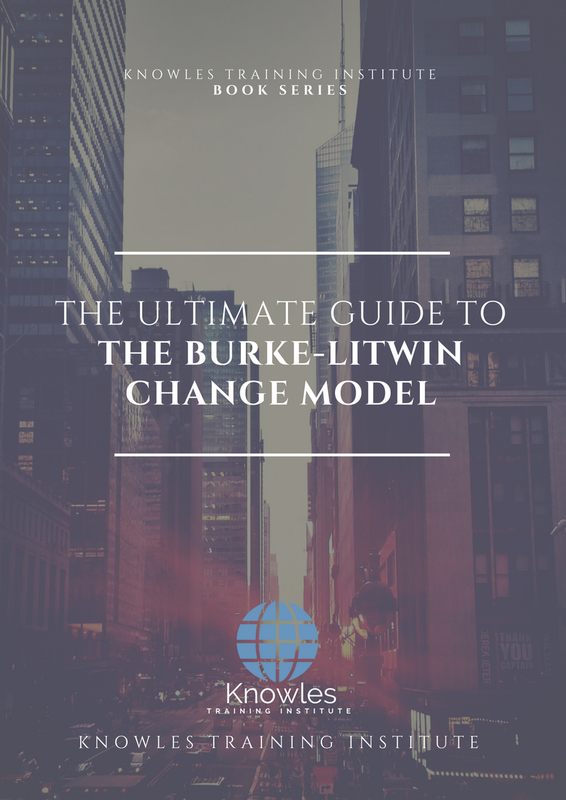 ● How to use the Burke-Litwin Change Model. 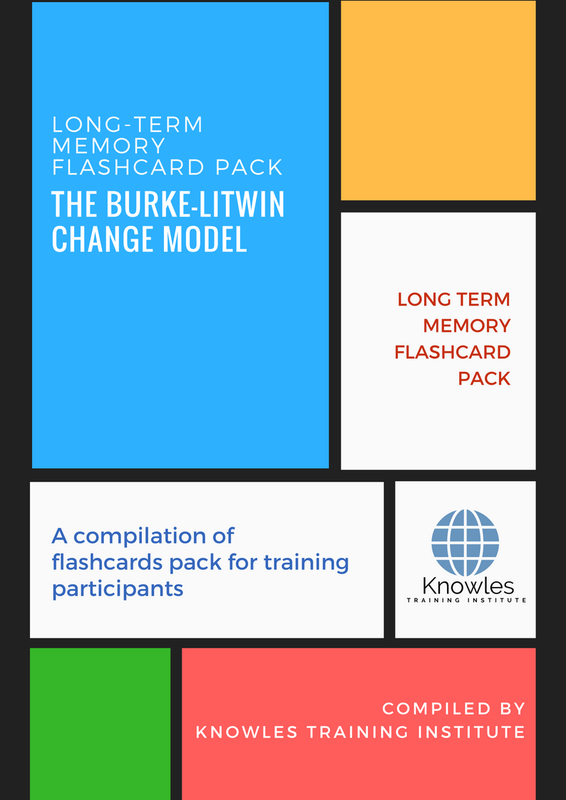 There are 3 pricing options available for this The Burke-Litwin Change Model training course. 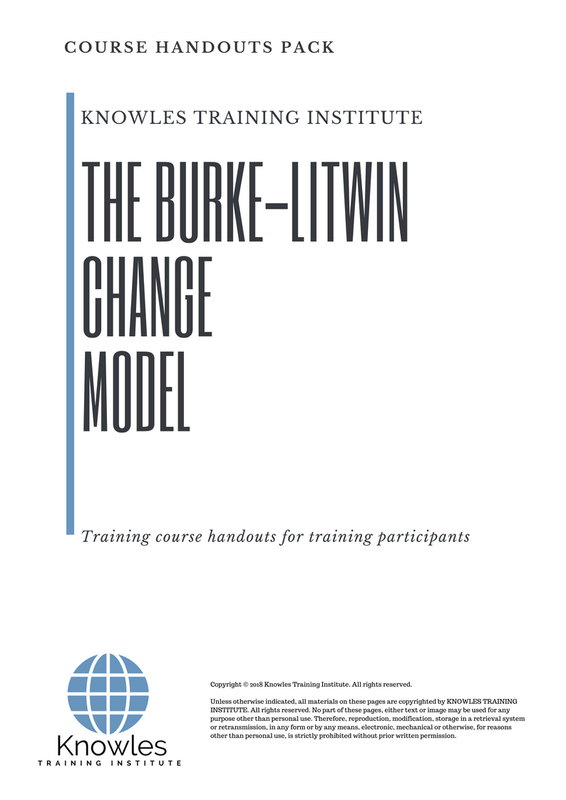 Course participants not in Singapore may choose to sign up for our online The Burke-Litwin Change Model training course. Request for this The Burke-Litwin Change Model course brochure. Fill up the short information below and we will send it to you right away! 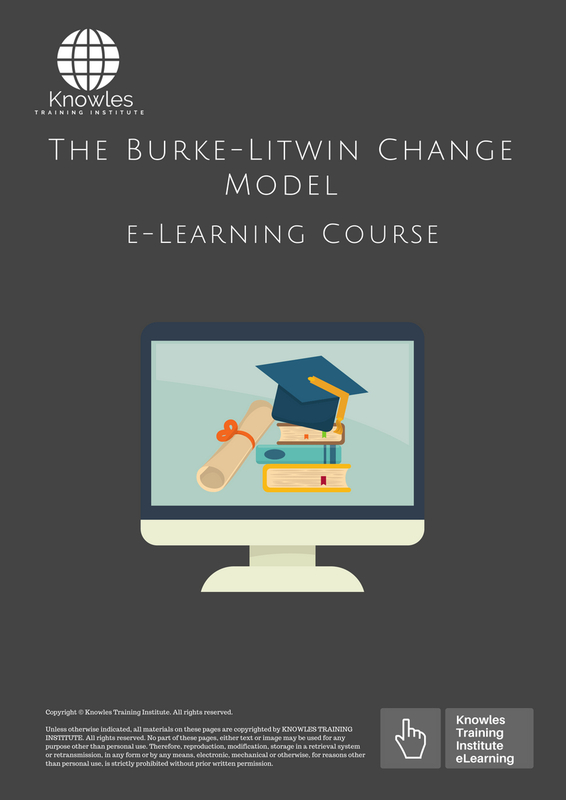 Register For This The Burke-Litwin Change Model Course Now! 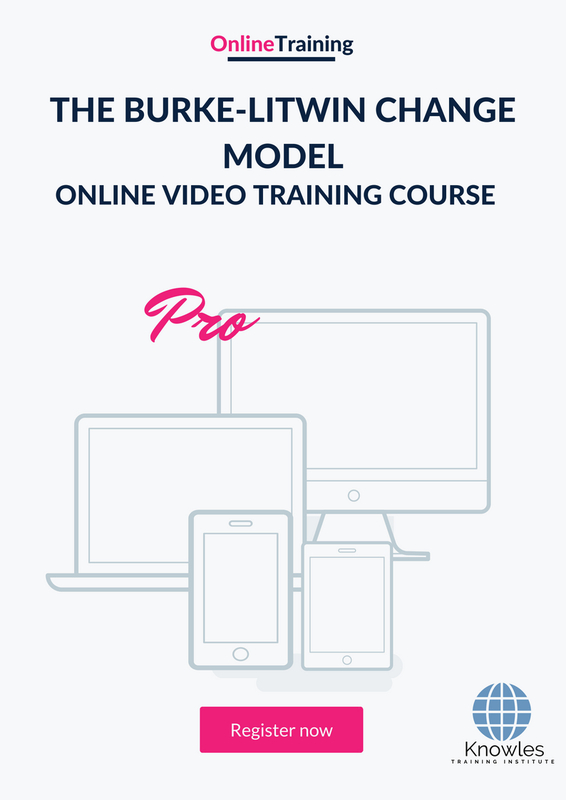 Share This The Burke-Litwin Change Model Training Course! 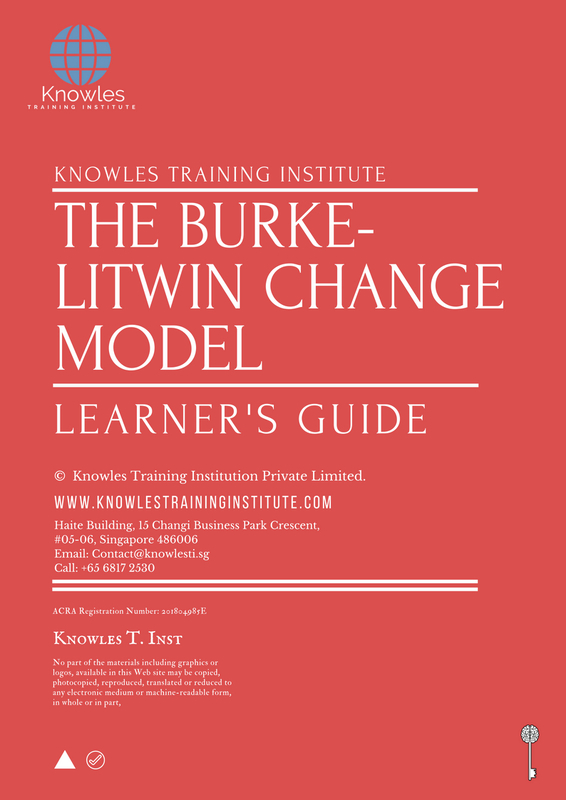 The Burke-Litwin Change Model course, workshop, training, class, seminar, talk, program, programme, activity, lecture. 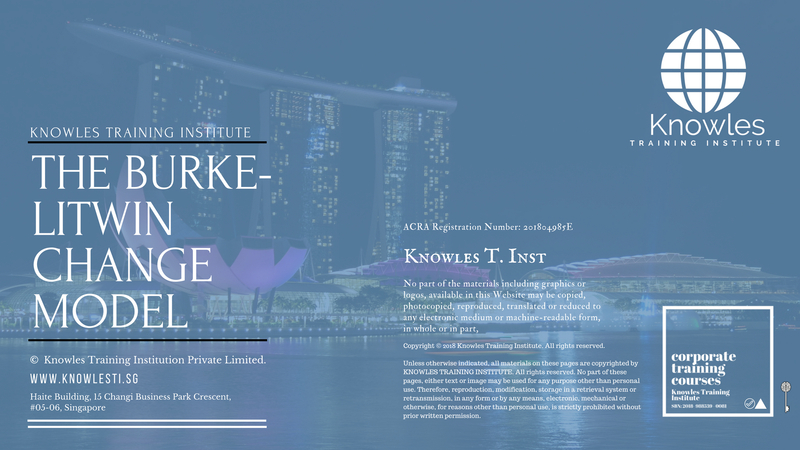 The Burke-Litwin Change Model courses, workshops, classes, seminars, talks, programs, programmes, activities, lectures in Singapore. The Burke-Litwin Change Model improvement tips, The Burke-Litwin Change Model techniques, improve The Burke-Litwin Change Model, improve The Burke-Litwin Change Model games, The Burke-Litwin Change Model improvement exercises, improve The Burke-Litwin Change Model power, how to have good The Burke-Litwin Change Model, how to have good The Burke-Litwin Change Model in studying, how to build up your The Burke-Litwin Change Model, how to improve The Burke-Litwin Change Model how to improve The Burke-Litwin Change Model course in Singapore. Enhance, boost, build up, enlarge, heighten The Burke-Litwin Change Model course in Singapore. Increase, intensify, raise, reinforce, strengthen The Burke-Litwin Change Model. Upgrade, amplify, boom, elevate, exaggerate, magnify, grow, gain The Burke-Litwin Change Model. Develop The Burke-Litwin Change Model, multiple, power up, beef up, bolster, establish, extend The Burke-Litwin Change Model. Invigorate, restore, step up, toughen, empower, fortify, regenerate The Burke-Litwin Change Model. Rejuvenate, renew, escalate, expand, maximize The Burke-Litwin Change Model. Powerful, mighty, impressive, competent, great, excellent, exceptional The Burke-Litwin Change Model in Singapore. Superb The Burke-Litwin Change Model. 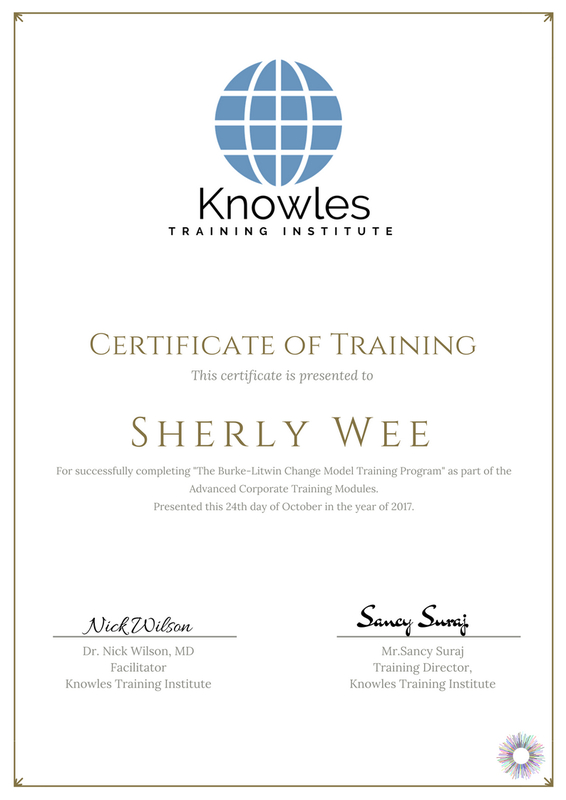 Super, superior, strong, solid, active The Burke-Litwin Change Model training courses and workshops in Singapore. The Burke-Litwin Change Model enhancement, booster, building up, enlargement, heightening, increment, strengthening, amplification. 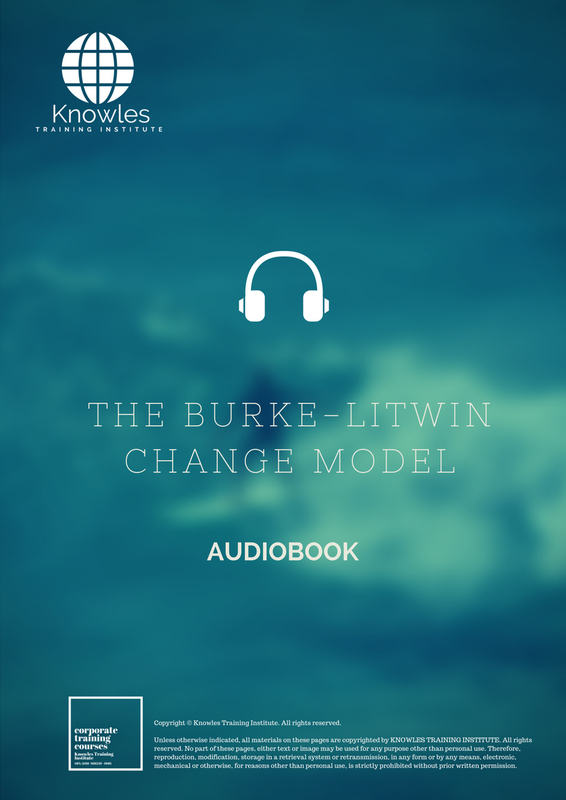 The Burke-Litwin Change Model magnification, growth, development, power, empowerment, regeneration. The Burke-Litwin Change Model rejuvenation, development, escalation, expansion. 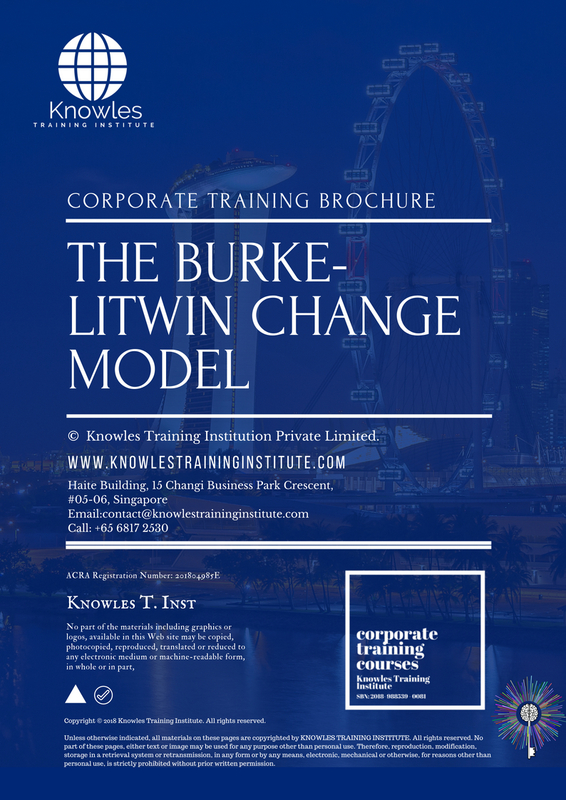 The Burke-Litwin Change Model maximization, power training courses & workshops in Singapore.